GAP Sales Associate understands what exactly the GAP customers need and assist them in finding the right product. Some of the common responsibilities common for a Gap Sales Associate are proactively helping the customers in the busy retail environment, develop a constructive work atmosphere, Discerning the Gap products from competitors through genuine associations, delivering results that contribute the success of the store, demonstrate high degree of integrity and impose company policies, accomplishing floor replenishment and transporting exactly to the customer. These associates should also represent the company and attend holiday promotions or large sales events. 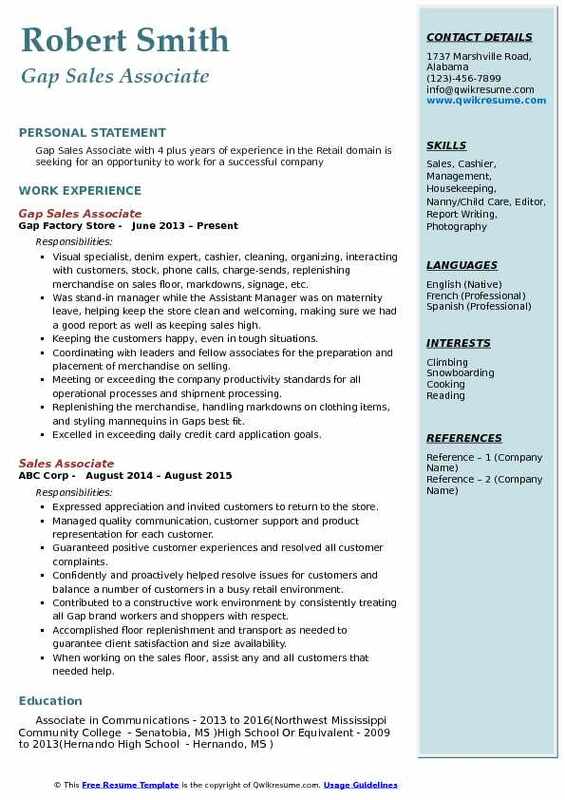 The most eligible Gap Sales Associate Resume emphasizes on skills such as proficiency in GAP point of sales System, adaptability, willingness to work at evenings and weekends, knowledgeable about current fashion trends and time management skills. 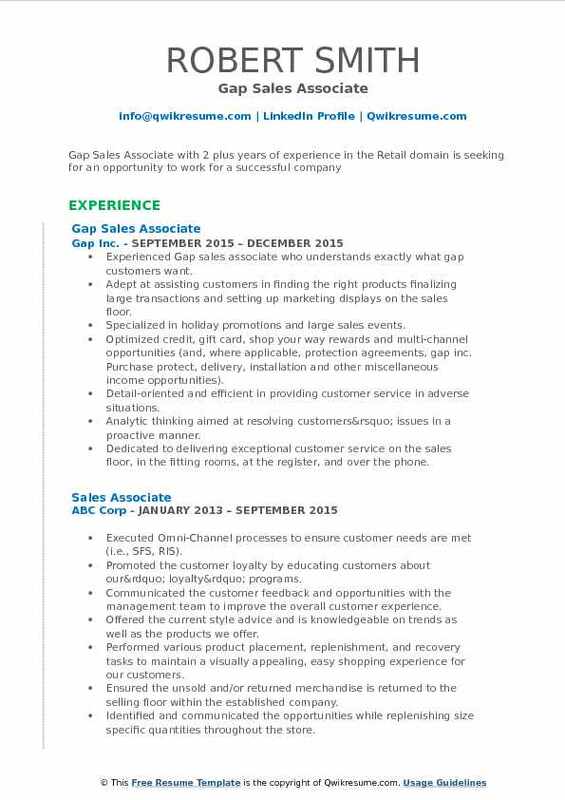 A High School diploma with prior experience in retail or customer service is sure to limelight the Resume. Objective : Motivated Gap Sales Associate with 2 years of experience and with a passion for creating collaborative, engaging environments. Experience in activity leadership and staff supervision. Active listener with superb oral and written communication skills. Dependable, responsible, and enthusiastic. Working with customers all day offering our store brand credit card that helps them save money if they shop with us and helps them keep shopping with us. Folding down the clothes and putting our go backs back where they belong on the sales floor. Assisting the customers with whatever they may need like a certain size or item. Responsible for interacting with employees and customers to create a positive, friendly environment. Maximizing the sales by ensuring a neat, clean and organized store while also working the cashier. Responsible for putting the product back on the sales shelves at the end of a shift. Replenishment and recovery tasks to maintain a visually appealing, easy shopping experience. Organized, good with money, outstanding people skills, leadership abilities, helping other employees when they have difficulty performing certain tasks, politeness, quick learner, team-oriented, time-management, etc. 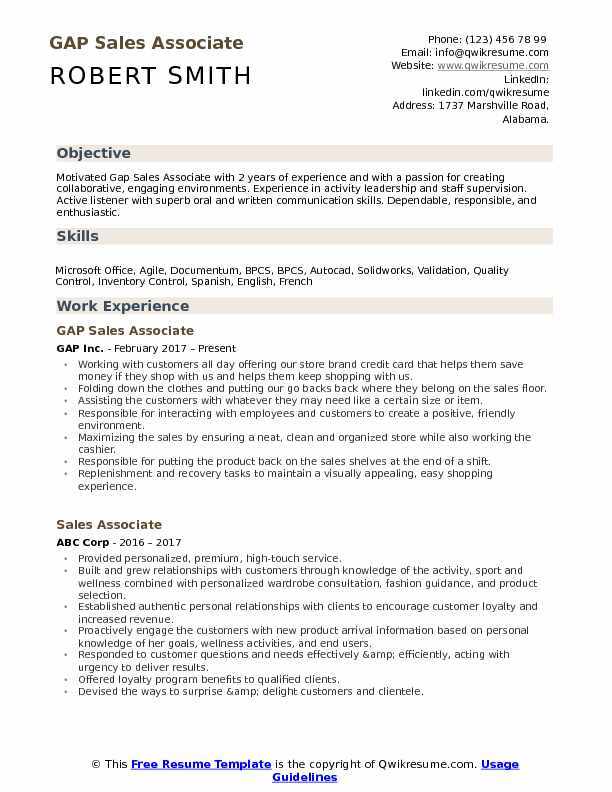 Objective : Highly motivated Gap Sales Associate with 4 plus years of experience and strong people skills, attention to detail, problem-solving skills, and a solid sales background. Skills : Energetic, Excellent Multi-tasker, Fast Learner, Multi-tasker, Organizational. Establishing and maintaining a solid understanding of the company POS system in order to efficiently process customer and store transactions. Maintaining an open and positive relationship with store management team. Maintaining a professional appearance by adhering to company dress code standards. Engaging the customers and enhancing their shopping experience, working the register as a cashier and ensure that the customers' checkout experience was fast and friendly. Work the sales floor by making sure our products were neat and organized, and as a stock associate I received our shipment, helped process it, and put it out on the sales floor. Focussing on increasing sales by integrating ways of reaching customers through relevant community events. 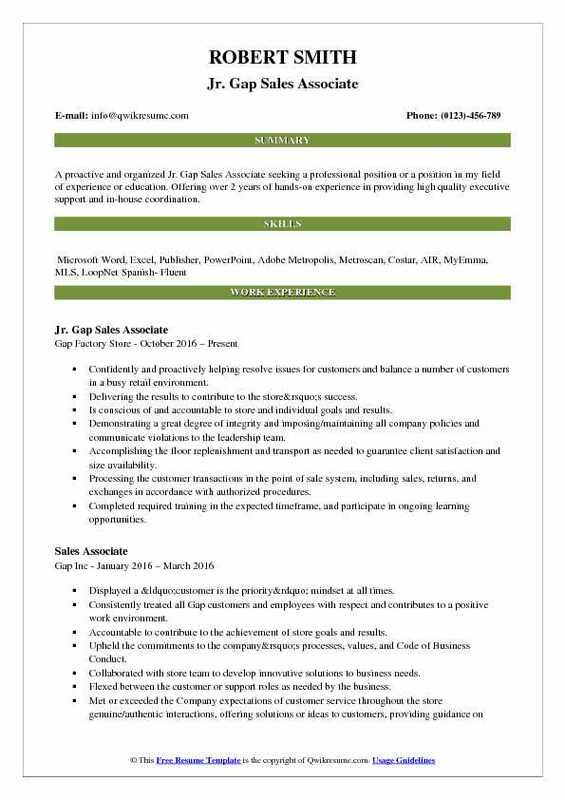 Objective : A proactive and organized Jr. Gap Sales Associate seeking a professional position or a position in my field of experience or education. Offering over 2 years of hands-on experience in providing high quality executive support and in-house coordination. Confidently and proactively helping resolve issues for customers and balance a number of customers in a busy retail environment. Delivering the results to contribute to the store’s success. Is conscious of and accountable to store and individual goals and results. Demonstrating a great degree of integrity and imposing/maintaining all company policies and communicate violations to the leadership team. Accomplishing the floor replenishment and transport as needed to guarantee client satisfaction and size availability. Processing the customer transactions in the point of sale system, including sales, returns, and exchanges in accordance with authorized procedures. Completed required training in the expected timeframe, and participate in ongoing learning opportunities. Partnering with other selling and sales support associates and cashiers to provide superior customer service (i.e., locating merchandise, assisting the customers, answering phones, and ring register). 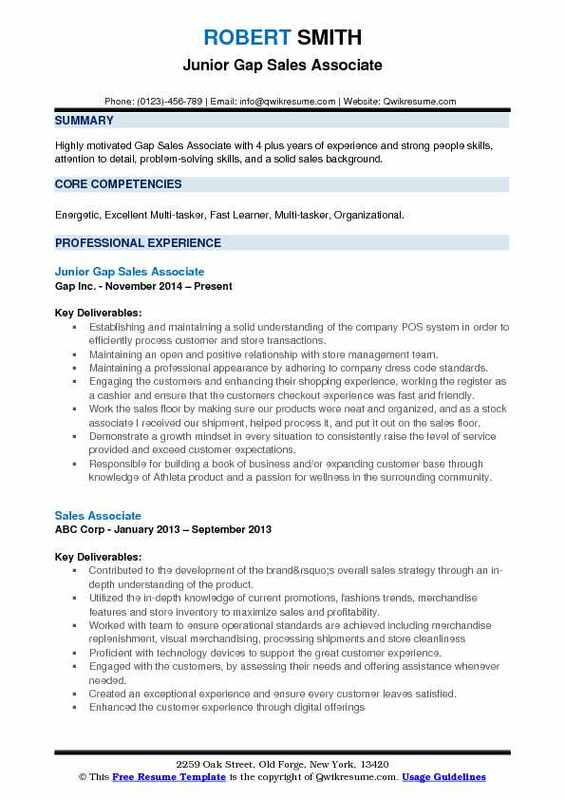 Experienced Gap sales associate who understands exactly what gap customers want. Adept at assisting customers in finding the right products finalizing large transactions and setting up marketing displays on the sales floor. Specialized in holiday promotions and large sales events. Optimized credit, gift card, shop your way rewards and multi-channel opportunities (and, where applicable, protection agreements, gap inc. Purchase protect, delivery, installation and other miscellaneous income opportunities). Detail-oriented and efficient in providing customer service in adverse situations. Analytic thinking aimed at resolving customers’ issues in a proactive manner. Dedicated to delivering exceptional customer service on the sales floor, in the fitting rooms, at the register, and over the phone. Contributed to the sale of 10 Gap visa cards in the first three months of employment. Visual specialist, denim expert, cashier, cleaning, organizing, interacting with customers, stock, phone calls, charge-sends, replenishing merchandise on sales floor, markdowns, signage, etc. Was stand-in manager while the Assistant Manager was on maternity leave, helping keep the store clean and welcoming, making sure we had a good report as well as keeping sales high. Keeping the customers happy, even in tough situations. Coordinating with leaders and fellow associates for the preparation and placement of merchandise on selling. Meeting or exceeding the company productivity standards for all operational processes and shipment processing. Replenishing the merchandise, handling markdowns on clothing items, and styling mannequins in Gaps best fit. Working as a team member performing cashier duties, replenishment duties, and promotional duties. 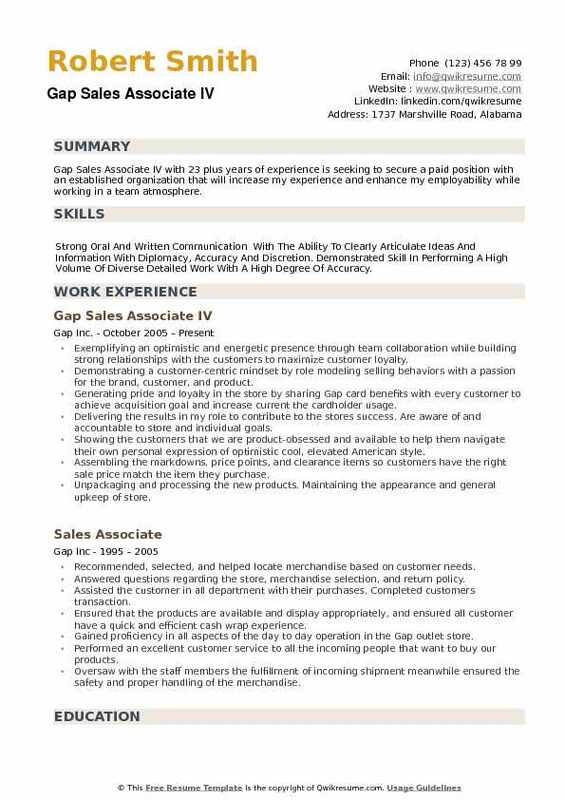 Objective : Dedicated and motivated Gap Sales Associate with 3 plus years of experience in the Retail domain is seeking entry level position to hone skills with a company synonymous with success. Guiding customers in their purchases, offering suggestions and advice on which products fit customers needs. Upselling by convincing customers to purchase higher quality products and accessories to complement purchases. Regularly aiding the customers in fulfilling orders, requiring verification of sensitive information, and resolution of any conflicts with product availability by offering alternatives. Responsible for promoting and selling company’s products to a various range of customers. Providing the solutions and inspiration to customers in a fast-paced retail environment. Showing our customers that we are product-obsessed and available to help them navigate their own personal expression of optimistic cool, elevated American style. Ensuring store is consistently recovered and customer-ready every day meeting brand standards on the sales floor and back-of-house. Ensuring that the product is always available to the customer and represented in a compelling way. 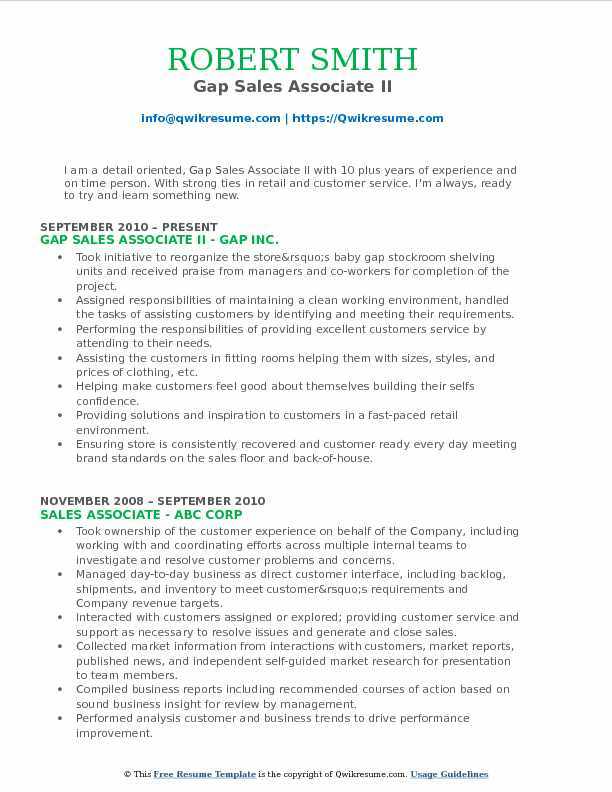 Summary : I am a detail oriented, Gap Sales Associate II with 10 plus years of experience and on time person. With strong ties in retail and customer service. I'm always, ready to try and learn something new. Took initiative to reorganize the store’s baby gap stockroom shelving units and received praise from managers and co-workers for completion of the project. Assigned responsibilities of maintaining a clean working environment, handled the tasks of assisting customers by identifying and meeting their requirements. Performing the responsibilities of providing excellent customers service by attending to their needs. Assisting the customers in fitting rooms helping them with sizes, styles, and prices of clothing, etc. Helping make customers feel good about themselves building their selfs confidence. Providing solutions and inspiration to customers in a fast-paced retail environment. Ensuring store is consistently recovered and customer ready every day meeting brand standards on the sales floor and back-of-house. 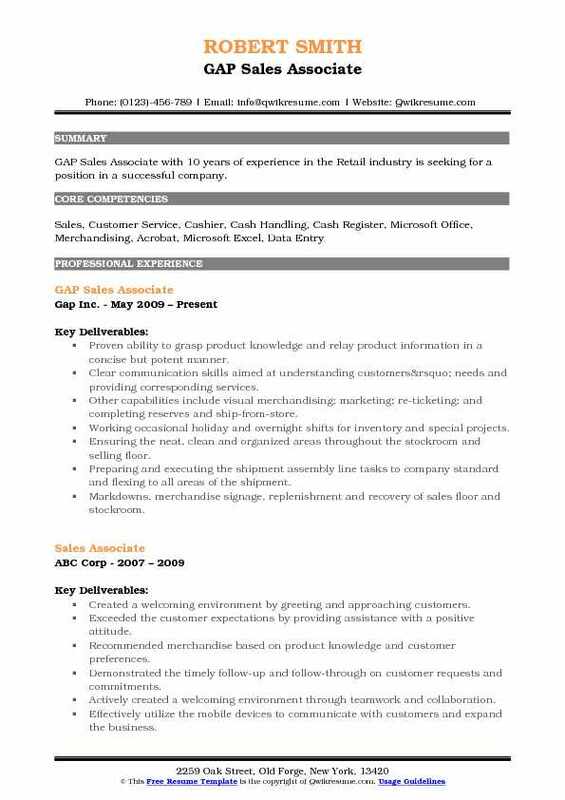 Summary : GAP Sales Associate with 10 years of experience in the Retail industry is seeking for a position in a successful company. Proven ability to grasp product knowledge and relay product information in a concise but potent manner. Clear communication skills aimed at understanding customers’ needs and providing corresponding services. Other capabilities include visual merchandising; marketing; re-ticketing; and completing reserves and ship-from-store. Working occasional holiday and overnight shifts for inventory and special projects. Ensuring the neat, clean and organized areas throughout the stockroom and selling floor. Preparing and executing the shipment assembly line tasks to company standard and flexing to all areas of the shipment. Markdowns, merchandise signage, replenishment and recovery of sales floor and stockroom. Maintaining the clean work environment in order to provide the best experience for the customer. Practiced exemplary customer service, courteously greeted customers and efficiently processed transactions within busy, fast-paced retail environments. 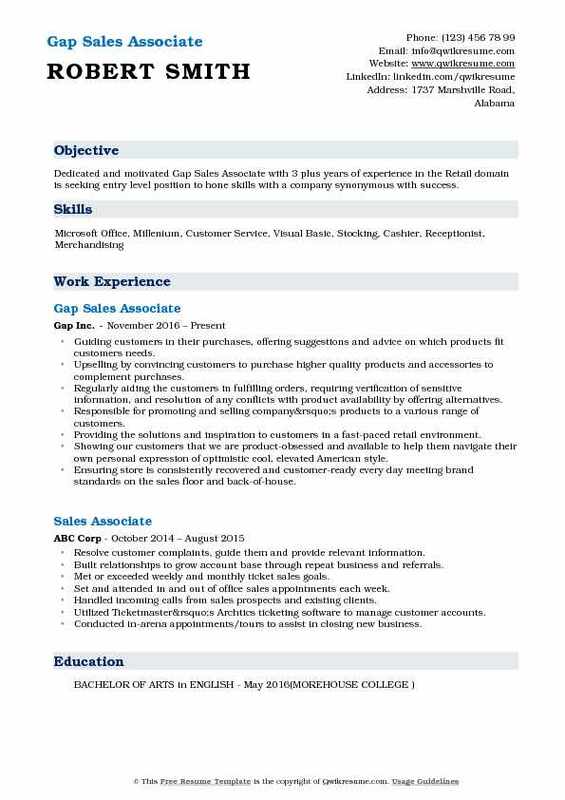 Objective : GAP Sales Associate with 2 years of experience in the Retail industry is seeking for a position in a successful company. Cashier duties in a quick and efficient manner while completing all sale goals by asking/informing each and every customer about the benefits of the gap card. When cashiering, handle sensitive customer information, and cash, credit, and debit card transactions. Regularly stocked, updated signage, priced and merchandised all products in the store, and was required to have a working knowledge of almost all products and services offered at the store. Deliver results in their role to contribute to their stores' success. Are aware of and accountable to store and individual goals. Responsible for putting the product on the sales shelves after receiving the shipment. Responsible for greeting customers and making sales based on customer needs. Perform various product placement, replenishment, and recovery task to maintain a visually appealing, easy shopping experience or customers. 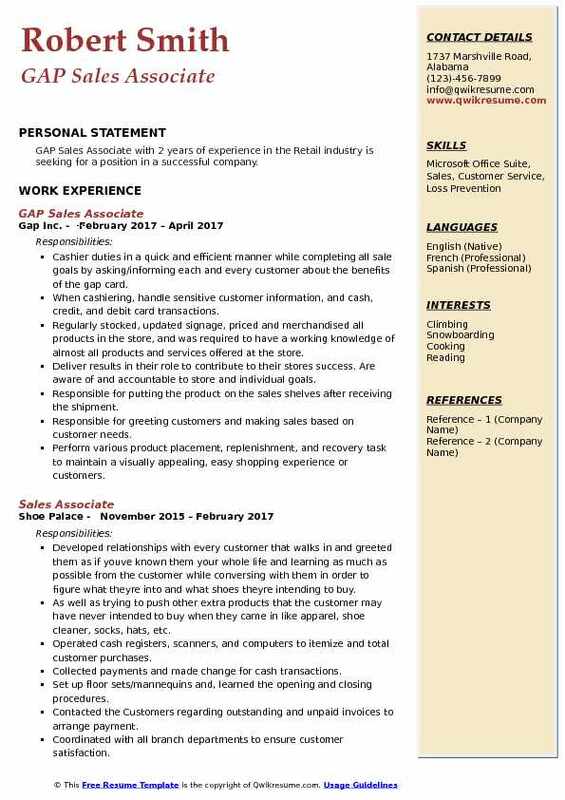 Summary : Gap Sales Associate IV with 23 plus years of experience is seeking to secure a paid position with an established organization that will increase my experience and enhance my employability while working in a team atmosphere. Skills : Strong Oral And Written Communication With The Ability To Clearly Articulate Ideas And Information With Diplomacy, Accuracy And Discretion. Demonstrated Skill In Performing A High Volume Of Diverse Detailed Work With A High Degree Of Accuracy. Exemplifying an optimistic and energetic presence through team collaboration while building strong relationships with the customers to maximize customer loyalty. Demonstrating a customer-centric mindset by role modeling selling behaviors with a passion for the brand, customer, and product. Generating pride and loyalty in the store by sharing Gap card benefits with every customer to achieve acquisition goal and increase current the cardholder usage. Delivering the results in my role to contribute to the store's success. Are aware of and accountable to store and individual goals. Showing the customers that we are product-obsessed and available to help them navigate their own personal expression of optimistic cool, elevated American style. Assembling the markdowns, price points, and clearance items so customers have the right sale price match the item they purchase. Unpackaging and processing the new products. Maintaining the appearance and general upkeep of store.